Southern Bleacher has been an institution in Graham, TX, since it relocated here in the 1950s from Arkansas. Through massive projects such as building the grandstand at Texas Motor Speedway in 1996, it has helped to give the City of Graham a deserving place in the pantheon of manufacturing hubs. 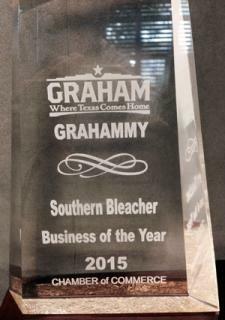 Today, the Graham-based company employs more than 200 people directly and contributes to the area&apos;s economy indirectly in many more ways; just a couple of reasons why Southern Bleacher won the Grahammy for Business of the Year. Read more about the award at GrahamLeader.com. You can also download a letter from Rep. Randy Neugebauer (TX-19) congratulating Southern Bleacher on their award.